As I type Coventry are winning so it’s time to crack open the bubbly. 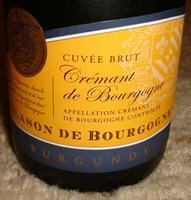 They’re playing Colchester so it’s Tesco Blason Cremant de Bourgogne. It looks like a bottle of Champagne, in much the same way as Coventry look like a Premiership side if you’re hopeful and catch them at just the right angle. It opens with a reassuring pssshhh, and pours with plenty of creamy bubbles. Its very pale with just the tiniest hint of pink, if it was paint it would be rose-white. The bubbles are very small and reasonably persistent. It smells clean in a traditional method sparkling kind of way with a yeastiness that teeters between fresh bread and festering socks, but not in a bad way. It’s off dry with a medium acidity. The bubbles dissipate quite quickly in the mouth. It has some crisp lemony fruit with a reasonable hit of bready, Marmitey yeast. 12% alcohol means I could celebrate a big Coventry win without having to stay in bed all day tomorrow. At £7 a bottle this is reasonable value for French fizz. It’s certainly not Champagne, but it doesn’t pretend to be. I think there’s much better sparkling wine to be had from Spain in this price bracket, with some fabulous Cava at embarrassingly low prices, so I’d generally opt for that instead when in need of affordable weekday fizz. Sounds interesting. I almost always opt for more affordable bubbly, so Champagne is not really an option. I’m feeling fizzy these days myself. Hence the sparkling Shiraz the other day and I’ve got a blog planned for a friend’s birthday Wednesday.